I have been neglecting my blog recently and there really is a valid excuse – an event-filled week and one of the busiest ones we’ve had in a long, long time. Once you see how I spent the last six days then you’ll understand why I haven’t had the time to post anything. MONDAY – Dinner with friends of very good friends from Moscow, F & S. We went to their rented villa in Las Chapas for some rosé champagne then walked towards the beach to a little restaurant, Club 500 filled with locals having seafood. We all shared several appetizers – pulpo (octopus), calamares a la plancha (grilled squid), sardinas a la plancha (grilled sardines) , boquerones fritos (fried anchovies), pez espada a la plancha (grilled swordfish) and a large mixed salad. For our main course, we all had the dorada a la sal (salt-baked sea bream) with lots of cold, white Viña sol. It’s always a pleasure to go on a “blind dinner” with people who you’ve never met and have a good time. TUESDAY – Morning churros at the Plaza de Los Naranjos in Marbella’s Casco Antiguo with a friend, Jacqui, along with her husband and two daughters. I haven’t seen her since we left Dubai in 2004 so it was a reunion of sorts and we spent an hour catching and eating churros while the children ran around the shady orange tree filled square. WEDNESDAY – Our first summer guests arrived. My brother in-law, his wife and three children arrived from Buenos Aires and took the AVE from Madrid to Malaga where we met them at the train station and drove straight home for a simple dinner of barbecued chicken, potato salad, tomato mozzarella salad and a summer dessert of peach tarte tatin (recipe to follow in another post). We also had an impromptu birthday “cupcake” for their eldest son Marcos who was turning 17 the following day. I ordered delicious red velvet cupcakes from Cake Marbella. 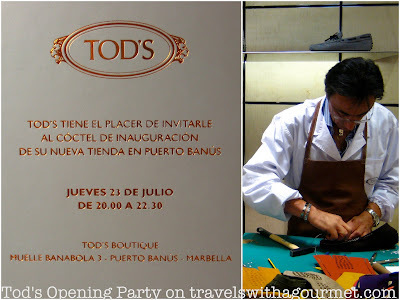 THURSDAY – Cocktails in Puerto Banus for the opening of the brand new Tod’s store right on the port. There was a cobbler making Tod’s famous driving moccasins by hand on a table in the corner giving guests a chance to see how labor-intensive it is to make their shoes. We also passed by the Ferragamo store to see the new Yohjo Yamamoto collection before we picked up the children and had dinner at La Pappardella sur Mare, an Italian restaurant in Laguna Village to celebrate Marcos’ birthday. FRIDAY – Invited to a White Party where we enjoyed Cocktails and dinner at the terrace of La Veranda at the Hotel Villa Padierna. Lots of Taittinger Brut-Reserve with delicious canapes of peking duck, chicken curry skewers, shrimp and pistachio skewers, goat’s cheese in filo bundles, smoked salmon and sea bass ceviche. We sat down to dinner at 10:00 p.m. and were served a delectable five-course dinner: foie gras millefeuille with smoked eel and green apple, roasted scallop on tomato juice, seared sea bass with cauliflower puree, roasted tenderloin with fork-mashed potatoes and caramelized raspberries and pistachio ice cream. Both white and red wine were served with the dinner but I stuck to champagne the entire evening. Petits-fours and espresso rounded out the meal and while some of us headed home, most of the party continued at Olivia Valere. SATURDAY – Finally, the end of the week and we spent the whole day on the beach in Marbella at Playa Fantastica where we had our usual lunch of calamares fritos (fried squid rings), gambas pil-pil (prawns in chili and garlic), tomato, red onion, avocado and tuna salad. We had ordered their delicious seafood paella but there was some confusion and it never arrived (the first time it has ever happened) and we ended up just having a very light lunch and spent the rest of the day on the beach. For dinner, we had a simple meal at home with my in-laws and the kids and stayed on the terrace chatting till almost midnight. Thanks George! It's been a fun (though tiring) week and there's still more to come for the rest of the summer. You're living the life. Enjoy every minute of it!